Choir club is after school every Monday from 3.00pm-4.00pm with Mrs Parker. It is free for anyone to join from Year 3 to 6. The children learn a variety of different songs throughout the year, from popular pop through to folk, rock and classical. They go carol singing in the community at Christmas and perform at the Hitchin Festival in the Summer. The Autumn term is normally spent learning the challenging but FABULOUS songs for the Young Voices concert at the O2 Arena in January. This trip is the highlight of the choir year. If you would like to join choir, please come and get a letter from Mrs Parker or speak to the office. ‘you really missed a treat’, ‘it was wonderful’ , ‘the singing was really lovely’. ‘The children were a credit to the school and so well behaved’. 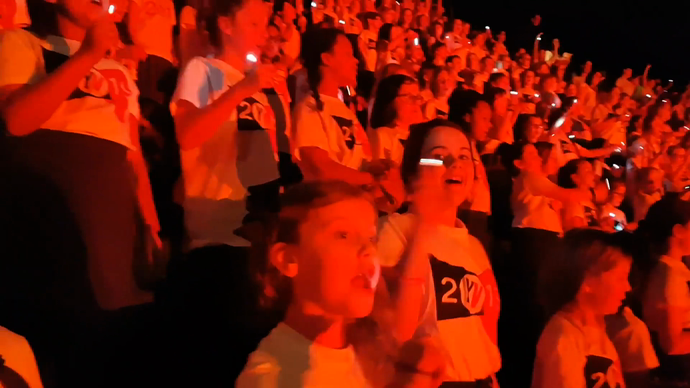 A snippet of our choir at this year's fabulous Young Voices concert at the O2 Arena.